Businesses need to produce financial statements to show how they are using the money invested in the business and if any of the investments have resulted in a return (profit). Financial statements are produced for the tax authorities, shareholders, investors and to satisfy legislation (company law). Financial Statements include Profit and Loss Accounts and Balance Sheets (Statement Of Financial Position), in this article we discuss what is a profit and loss account and how to compile a profit and loss account. We also provide an annotated profit and loss account. 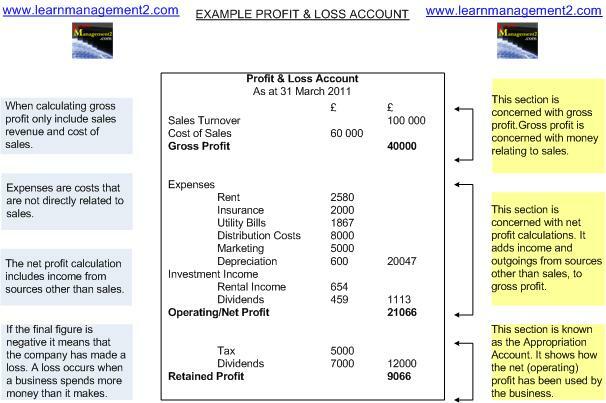 This diagram shows an example Profit And Loss Account with notes explaining each section of the Profit And Loss Account. What Is The Purpose Of A Profit And Loss Account? This is the amount of money received from the sale of products (and/or services) minus the cost of sales. This figure only relates to goods sold in the accounting period that the profit and loss account covers. The gross profit section of the profit and loss account is known as the trade account as it covers trading activity. Gross profit does not cover overheads and expenses that do not relate directly to the production or purchase of goods. This section takes into account all of the money received by the business and all of expenses incurred by the business. Net profit is gross profit minus the expenses and income not included in the calculation for gross profit. It covers other income and expenses as the cost of sales and sales revenue were taken into account for the gross profit calculation. In other words Net Profit = Total Revenue minus Total Expenses. The net profit section of the accounts is known as profit and loss account as it shows all of the profit and loss made by the business. Gross and net profit calculations allow businesses see where their main costs i.e. are they production related or non production costs. Businesses don't always end up with more than they started, this is known as a loss. A loss will occur when the cost of making sales is more than the amount of money it took to generate money. For example if I made sales of £100,000 and it cost me £105,000 to make the sales I have made a loss of £5000. Retained profit is the profit left in the company after all costs, taxes and dividends have been paid. Retained profit may be left in the bank as a future source of finance or it may be used for a variety of investments including purchase of stock, purchase of fixed assets, and research/development. We hope you enjoyed learning about profit and loss accounts and how to calculate each section of the profit and loss account. We continue our discussion of financial statements in our next article about Balance Sheets.